Club Penguin Cheats by Mimo777 Club Penguin Cheats by Mimo777: Carl The Hamster In Club Penguin?! Dood, are you liking the new Club Penguin game in the redecorated Dance Lounge? But, have you noticed the arcade game next to Bits & Bolts? It is not plugged in! Hmm, that leads me to wonder if Carl has been on the island! You know, Carl The Hamster that causes trouble with ANYTHING he can? 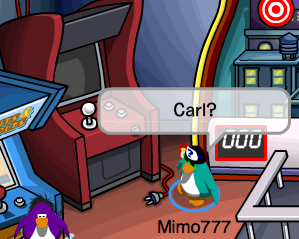 Well, if it's not Carl, it can only mean one thing, right? Another NEW GAME! Woot! I wonder what this game will be and when it will be here? Let me know your ideas, k? Hey, Jubjub123! Carl is Mimo's hamster. But he's not a normal hamster. He always messes things up and stuff like that! I think Mimo is joking about Carl the Hamster lol thats pretty funny tho 'cause that's what our hamster does. How do you know? Have you been to his house before, or did he tell you personally? is Carl the hamster fat???????? ?